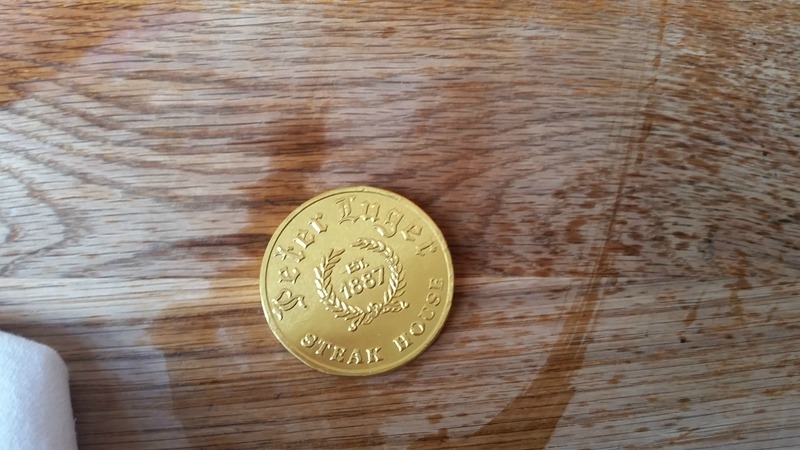 I crossed #15 off my to do list recently: I dined at Peter Luger. 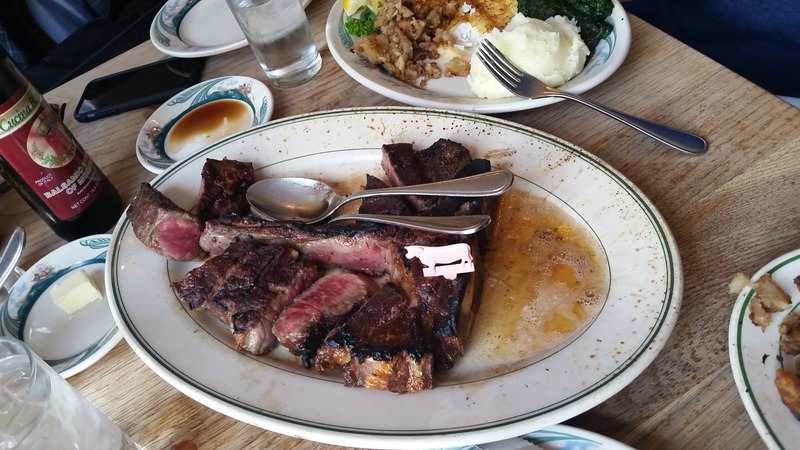 Sometimes iconic experiences don’t live up to the hype but Peter Luger absolutely did. I loved it. The restaurant is from another time. It was established in 1887 but is aging quite well. There are gleaming brass light fixtures throughout, wood paneling and in a little booth, a purple haired cashier (I’m pretty sure her hair isn’t purple out of trendiness). The servers, all men from what I can tell, are no-nonsense. Not brusque, but efficient. And then there’s the food. I dined at Peter Luger with a business partner for lunch so our meal was slightly less indulgent than it might have been if we went for dinner. This means we didn’t have the bacon appetizer – sadness! We had steak for two even though my dining companion T isn’t a big meat eater. Our waiter Manny steered me away from steak for one because the cut of beef, a Porterhouse, is superior in steak for two. T also ordered a sole entrée from the daily specials menu. You can indeed eat at Peter Luger even if you don’t eat meat. It’s quite the destination for international tourists (not in a bad way). If you go, keep in mind that Peter Luger is cash only (unless you have a Peter Luger credit card, and I don’t know anyone who does) and meals are not inexpensive. I will definitely go back – whenever I can get a reservation that is. Check out more of my NYC To Do List here. This entry was posted in Food, Life stories and tagged brooklyn, food, meat, nyc, Peter Luger, steak, to do list, williamsburg on May 11, 2015 by onechicklette.